I'm quite adventurous when it comes to my hair. Since I was a kid, I must have tried almost every hairstyle there is: from the boy-cut Demi Moore 'do during her 90's hit film Ghost to apple cut, telephone curly tresses, undercut, long hair, to safe ones like one-length--I seemed to have tried it all at one point in my life. After having finished college, I remember being giddy not only because I was able to received my diploma, but also because I would finally have that freedom to have my hair colored. Being young I never realized having my tresses chemically treated will eventually result to hair damage. Since then, I had been searching for the right product to use that will help my hair gain back its natural shine and softness. 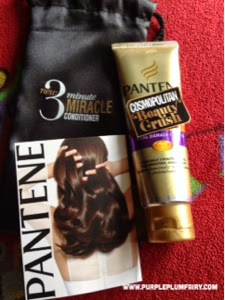 I was challenged to use the newly released Pantene Minute Miracle Total Damage Care Conditioner for a product review. Of course, just like any consumer, at first I was kind of doubtful. What makes this product different from all the others I've previously tried? I've used a lot of other brands including Pantene Conditioner before, but none had really satisfied me to the point that I'd stick to the brand. Usually, I would often change the products I use from time to time. 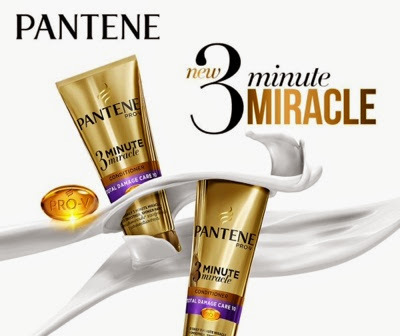 So when I was given an opportunity to review the latest hair innovation from Pantene called Pantene 3 Minute Miracle Conditioner Total Damage Care 10--touted as the best hair conditioner there is in the market today--I was pretty excited to try it. I recently had my hair cut and had them colored again from my good friend and one of the most sought after coiffeur, Mr. Tony Galvez of the renowned Tony Galvez Salon. Anyone who's ever been to a salon knew that the real hairdo' can only be seen a day after you've slept it over. I was anxious that my new do' won't look good on me. So it was just the right time to try on a new product. The author in different colors and haircuts. The sample sized given to me by the Belle De Jour Team was at 70ml tube. Actual product found at the groceries is at (SRP)Php59 for 70ml, Php159 for 180ml and Php259 for 340ml. Pantene 3 Minute Miracle Total Damage Care Conditioner promises to repair months of damage from your hair in just 3 minutes. The tube says it has the highest level of Terminal Amino-Silicones (TAS) which is proven to flatten and smoothes the cuticle cells of our hair. Upon opening the tube, I was surprised it smelled fruity. I love its fresh strawberry and raspberry scent. It awakens my senses, especially when I use the said conditioner in the morning. I thought it would just be like my old plain hair conditioner but then I was wrong. 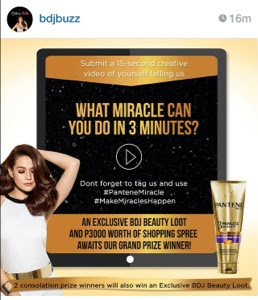 Pantene 3 Minute Miracle Total Damage Care was indeed a miracle product! 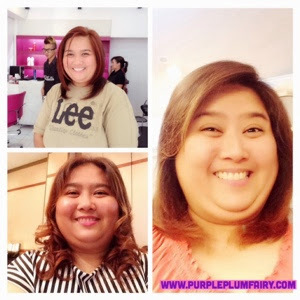 Having tried the product on my newly trimmed hair, my hair feels soft, bouncy and tangle-free! I just love the way my hair falls on my shoulder. Now everyday feels like I've had been to a hair salon and had a hair treatment. Nobody knows that I've just been in the shower with a tube of Pantene 3 Minute Miracle Total Damage Care Conditioner. Do you believe miracles can happen in just three minutes? I guess you won't believe it until you give it a try. So go ahead and get yourself a tube of Pantene 3 Minute Miracle Conditioner to experience it yourself. Thank you so much to the BDJ Team for giving me the chance to try Pantene 3 Minute Miracle Total Damage Care Conditioner and see how it does some miracles to my porous and checmically damaged hair.